Members of the Matrix Academy Trust ensure that the Trust acts within its charitable objectives as set out in the “Articles of Association of the Multi Academy Trust”. The members of the Academy Trust are the signatories to the “Memorandum of Association”. New members are appointed by the current members. The members are responsible for the appointment of the Chief Executive Officer and Trustees who are known as the Directors of the Trust. 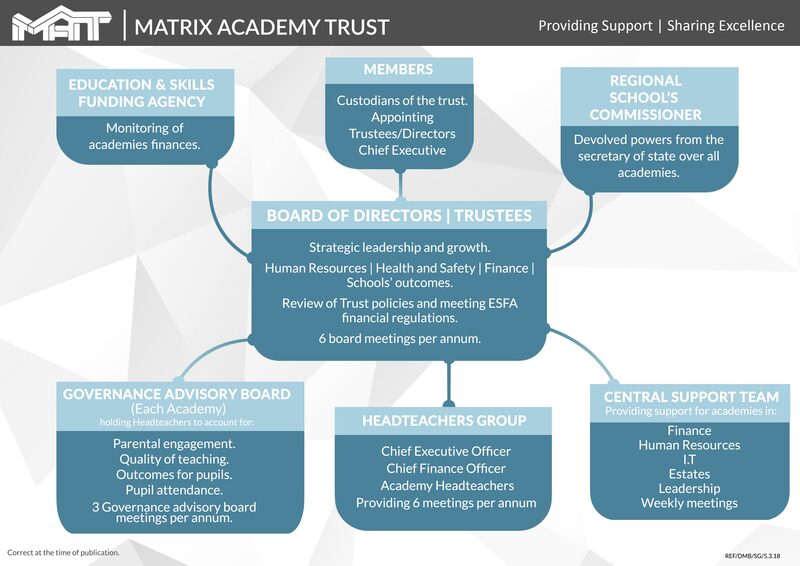 The Role of the Board of Directors (Trustees) The Board of Directors is the Governing Body for all the schools within the Matrix Academy Trust. It has three core functions: 1. To ensure clarity of vision, ethos and strategic direction of the Trust. 2. To hold the Chief Executive Officer (CEO) to account for the educational performance and wellbeing of the pupils and staff taught or employed in the schools of the Trust. 3. To oversee the financial performance of the individual schools of the Matrix Academy Trust, ensuring value for money and compliance with the Education and Skills Funding Agency’s (ESFA) Academies Financial Handbook. The Role of the Governance Advisory Board The Board of Directors has chosen to delegate governance functions to the “Governance Advisory Board.” This will inform and support the work of the Directors. The Governance Advisory Board has delegated responsibilities with no delegated powers. The remit of the Governance Advisory Boards is: To support and challenge the Headteacher about the educational performance of the school. To review detailed pupils progress and attainment data for the school compared to national and that of the other schools within Matrix Academy Trust. To assess the impact of the Trust’s internal processes and non-negotiables on school improvement including the quality of teaching, pupils’ academic and personal development, pupils’ behaviour and pupils’ attendance. To review parent and community engagement with the school. To report on the above to the Board of Directors highlighting issues and successes with any recommendations. The Role of the Chief Executive Officer (CEO) The Board of Directors, who are accountable, have delegated to the CEO the responsibility for the day to day operation of the Matrix Academy Trust. The CEO leads the Academy Trust’s Headteacher’s team and delegates responsibilities to these Headteachers, located in the individual schools, for the day to day operation of their school. The CEO is accountable to the Board of Directors for the performance of the Leadership Teams. The CEO has overall responsibility for the operation of the Academy Trust’s financial responsibilities and ensures the Trust is run effectively. The CEO delegates this responsibility to the Chief Financial Officer (CFO), who has day to day responsibility for the financial operations of the Trust. The Scheme of Delegation summarises the delegation as agreed by the Board of Directors.